The Gisburn Forest is unusual in the wider area of the Forest of Bowland in that it is a forest – that is it has trees! Lots of them. Those readers familiar with the Forest of Bowland will know that much of it is characterised by a lack of trees – the term “forest” referring to the area’s past as a royal hunting park. The location at the start of the walk lies close to Lancashire’s lost village of Stocks. Indeed the ruins of the old church can be seen to the rear of the car park. In the 1920s as Blackpool was becoming more and more popular attracting millions of visitors it was facing a problem with water supply. To meet this situation the Fylde Waterboard constructed a dam and flooded the head of the Hodder Valley to create the reservoir. The project required an army of over 500 men at its height. Although outside the area of flooding the church, vicarage, school and a number of farms were demolished to protect water quality. Now this whole area – forest and reservoir is an outdoor playground cared for by United Utilities and the Forestry Commission. Apart from the place’s obvious attraction to walkers there is a fishery on the reservoir while the Forest of Gisburn is a magnet to mountain bikers. (The Hub Café and Cycle Hire centre is passed on the way to School Lane car park)As will be seen on the trail this is one of the best places in Lancashire for bird watching with wildfowl and waders out on the water and then an impressive range of species attracted to woodland habitats. The walk below is superb circuit in one of the most attractive parts of the county – if not country. Summary: Easy with two pronounced gradients. 1. This route is very well waymarked all the way round the reservoir. which is reached 800yds after the beck. the path continues over pasture to a kissing gate. Through it turn right. 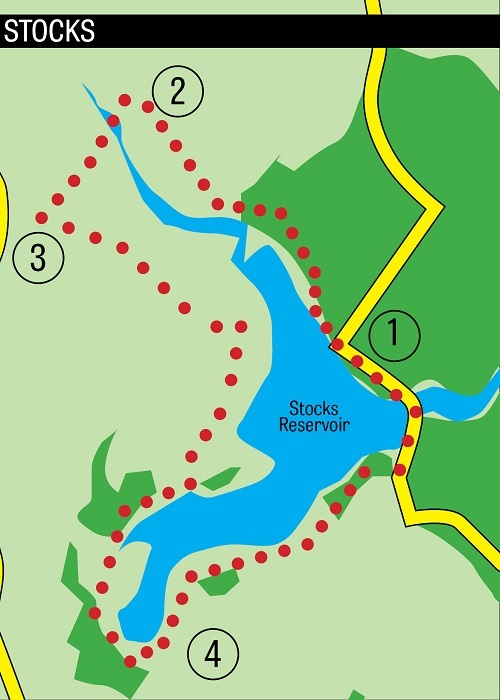 For the next section of the walk you will be out of sight of the reservoir as you climb up alongside Copped Hill Clough and then turn left onto a broad track leading around Eak Hill. 3	This track provides excellent walking for the next two miles. The route gradually returns to the shore. 4	Keep ahead on a footpath with the reservoir on your left. As you gain a little height you will have fine views across the water towards the Bowland Fells. After passing by a conifer plantation the trail leads down to the road. will take you through shoreline woods back to the car park.